June 25 will be a historic day in NASCAR as Alon Day becomes the first Israeli driver to compete in the top NASCAR series. Day will drive the BK Racing No. 23 EarthWater Limited Toyota Camry in the Toyota/Save Mart 350 in Sonoma, Calif., part of the Monster Energy NASCAR Cup Series. He comes to Sonoma having been crowned “King of Brands Hatch” by winning the June 11 ELITE 1 race in England, part of the NASCAR Whelen Euro series. Day plans to compete in the Euro Series championship this year, along with racing in the Cup series race at Watkins Glen and several races in the NASCAR XFINITY series. The Brands Hatch win was Day’s first this season, seventh overall and second at Brands Hatch. A 25-year-old Tel Aviv native, Day was named Israel’s Athlete of the Year in 2016. While at first glance, the notion of an Israeli driver in NASCAR might seem far-fetched, it is even more amazing given that until 2011, Israel still had a British Mandate-era law prohibiting all forms of motorsports competition. Because of that, most of his early competitive driving experience comes from playing video games and computer simulators. He started racing Go-Karts as a teenager, finishing second in the Israel Karting Championship. He then set off for Europe, competing in the Asian Formula Renault Challenge and the German Formula Three Championship, where he placed in the top 10 in both of his seasons. He came to America to race briefly in Indy Lights, then returned to Europe and started racing in the FIA GT series in 2013. In 2015 he started racing stock cars in the Whelen Euro Series. Despite having to learn about stock cars, he finished second in the series and won the Junior “Jerome Sarran” Trophy as rookie of the year. With his European success, Day was the first stock car driver from outside North America selected to NASCAR NEXT, an initiative to identify and develop up-and-coming drivers. A few weeks later, Levin met Day in Charlotte and started looking for sponsors to back Day. In racing, the driver secures a spot behind the wheel by paying the team through the sponsorships they get on their own. And fielding a competitive car “is incredibly expensive.” For example, Levin said, a car typically needs six sets of tires for a race, at $2,500 per set. It hasn’t been easy. In February, just before Day was to compete in the 2017 NASCAR opener at Daytona, Levin said Day’s rookie season was being postponed because of a lack of sponsorships. He initially went to Jewish-owned companies, many of which were unfamiliar with NASCAR, and found it an “uphill battle” because of a perception of it as “solely a Southern, Christian redneck sport.” Studies have shown that NASCAR fans are the most fiercely loyal to sponsors, much more than football, basketball or other sports. Levin used retirement funds and loans to cover Day’s four NASCAR races last year to qualify him for this year. While promoting Levin’s law practice, the car also sported a large Israeli flag and logos for Jewish organizations such as the Anti-Defamation League and Jewish Federations of North America. Recently, Levin established Racing For Israel, a tax-exempt group to help Day and other Israeli drivers compete. 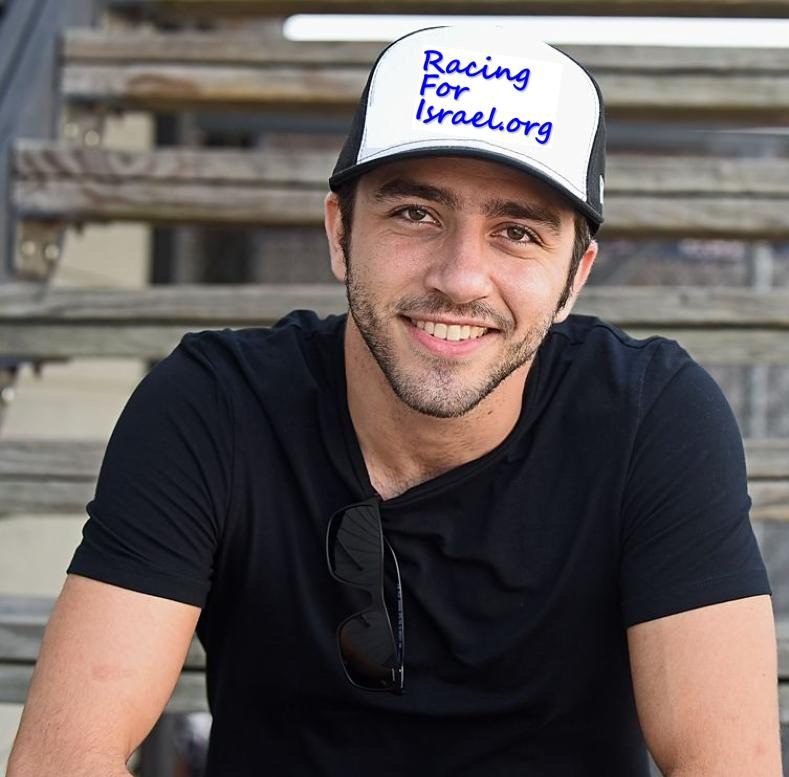 Its website is racingforisrael.org, and the group has identified six other drivers aside from Day. Last year, in Day’s first XFINITY race on Aug. 13, he ran in the Top 10 for most of the race, but was bumped in the last lap when he was running ninth, making it difficult to drive the car. He finished 13th and got the attention of the race announcers. The Toyota/Save Mart 350 is one of two road courses on the NASCAR Cup series. The race is scheduled to start at 2 p.m. Central and will be broadcast on Fox Sports 1. In his first practice day in the Cup series at Sonoma, Day finished 1.03 seconds behind the fastest lap, posted by Karl Lawson, to finish in 23rd position. His fastest lap has half a second from the Top 10. “It was a fantastic first day at the office,” Day said.